"Bless me Father, for I have sinned. My last confession was...."
I still remember the confessionals, those boxes of terror that lined both sides of the parish church we used to go to when I was a child. Growing up in the Philippines, the Sacrament of Confession (also now known as Penance or Reconciliation,) was done during the Sunday Mass. 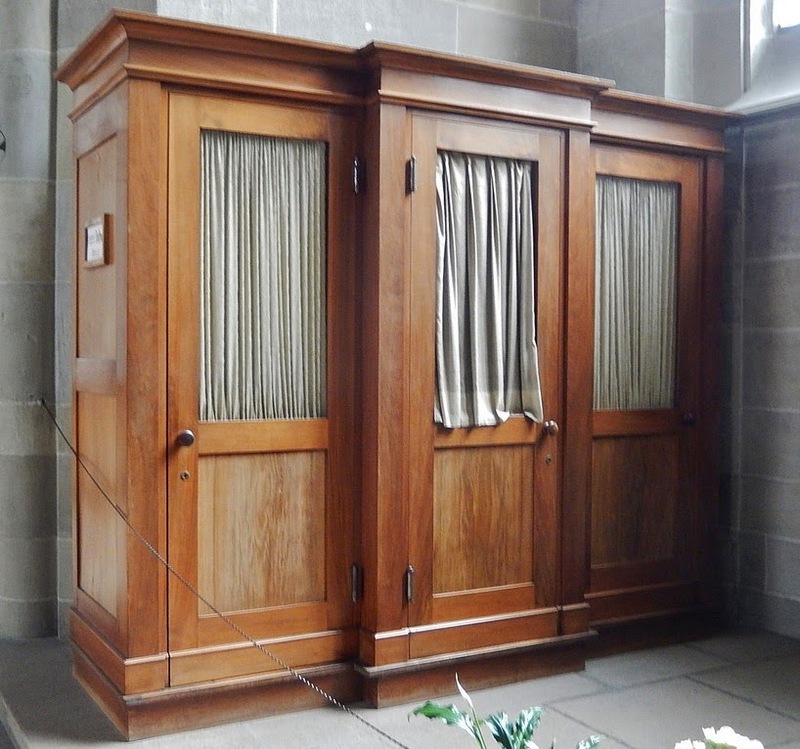 I remember that during the service, whenever I knew I needed to go to confession, I would keep glancing at the confessionals to see which priest would enter the 'box' and administer the sacrament. Since I attended Sunday Mass consistently at the time, I knew which priests had a reputation for being strict and scary, and which ones where more approachable and, shall we say, 'gentle' as far as assigning penance before granting absolution. Being required the trio of praying the entire rosary, giving alms AND fasting was considered bad news compared to simply being required to say three Hail Mary's and the Act of Contrition. One had to choose well. And if you can time your confession—if only to guarantee ending up with the 'nice' priest—then do so to the best of your ability! I remember the trepidation I felt during my very first confession...and each and every one thereafter. It was held in our school chapel and the nuns made sure we were adequately prepared for this sacrament. (Translate: The idea of a policing God who keeps scores was well-ingrained in this Catholic girl's mind.) I recall seeing some classmates who went before me, sobbing while confessing. I think I teared up a little bit but I'm not sure now if it was because I felt touched by the Holy Spirit or more because of my sense of shame after I just admitted my faults and inadequacies to a complete stranger. And in the spirit of coming clean—this is about confession, after all—I might as well admit that one of my most embarrassing life events also happened during confession. You know those movie scenes where the character enters the confessional, all hyped up to come clean as she emotionally enumerates her sins, only to eventually find out that the priest wasn't there yet when she started?? Yes, that was me. To make matters worse, the priest knew of my overeagerness because he was actually there, but attending to another penitent on the other side. Silly me, I didn't even notice that the screen divider wasn't open yet and that it was way too quiet while I was wasting all my words and all that emotive outpouring. When the screen finally slid open and the priest started to speak, I knew that he knew because I swear I heard a slight giggle in his voice. That could just be my paranoia talking but I'm pretty sure I left that priest shaking his head. Not only did I start without him, in the end, when he gave me my penance and asked that I recite the Act of Contrition right there and then, I had to admit to him that I hadn't memorized the prayer. He probably couldn't understand how someone who seemed overly excited to confess could show up so unprepared for penance. Sometimes I really just surprise myself at how much humiliation I'm capable of! Suffice it to say that this sacrament has never been a favorite of mine and one that I continue to avoid at all costs to this day. This week, it'll be my son's turn. He will receive this very same sacrament for the first time. It made me smile and gave me peace of mind when I read the memo that parents should take this opportunity to teach the children that God is not a law-enforcer, but instead one who is about kindness, friendship and unconditional love. I'm happy that my son is learning this now and won't grow up with a sense of fear towards a God who only keeps scores and takes only perfection. Another positive thing I noticed was that his religious education class and the Church now refer to the sacrament as 'Reconciliation' rather than 'Confession'. As a matter of fact, my son had no idea what I meant when I first referred to it as 'confession'. I do think 'reconciliation' sounds more inviting, less authoritative and not at all one-sided. To me, it focuses more on a mutual process of making amends, forgiveness and a moving forward from both sides. Asking for forgiveness is anything but easy. To ask for forgiveness necessitates the grace of humility. To admit one's own wrong-doing inevitably breaks through any illusions of perfection we may have about ourselves. It requires a willingness to be vulnerable because you need to open yourself up to dig deep and acknowledge your failings, both to your self as well as to the one you ask forgiveness from. This is also why at the heart of asking for forgiveness lies courage. It is as much about our courage to acknowledge our flaws, as it is about our courage in confronting the possibility that forgiveness is never guaranteed when we ask for it. There's always that risk. However, during this time when my son is about to go through this sacrament, I assured him that God's love and capacity to forgive is way beyond what he can imagine. I told him that God knows he will still make mistakes in the future but what's important is for him to sincerely want to do better. That's what gives meaning to the act of asking for forgiveness. In the end, I believe that's what God wants for all of us. It's not flawlessness, but that we simply never lose our internal compass that shows us not just what is right from wrong, but most importantly points us toward the direction of the best version of our selves. I wish my son much courage as he goes through this rite of passage. Most of all, I pray that he feels deep in his soul how this sacrament has nothing to do with fear, nor shame, and is really all about Love and Compassion. Growing up Baptist I was always so obsessed with the idea of confession. To us Baptist kids it seemed so cool that Catholic kids could do anything they wanted go to a closet admit it and start all over again. Of course, being an adult I know that it is alot more than that but it seems like a fresh start. That's interesting hearing it from a different perspective, Rena! I guess in a way whenever we ask for forgiveness, assuming it's a sincere one, it really becomes like a fresh start. I really just hope my son learns (eventually) the spiritual component of it, more than the religious. Thanks for your perspective! I was once reamed out pretty badly by a priest at St. Peter's in Rome, upsetting me so much I never went again. Not kidding. Oh my, Carol. I'm so sorry. That's just...ummm...what's the word?.....WRONG!! Some people are really just in the wrong profession. And the Catholic Church wonders why it's losing followers? What ever happened to compassion? Anyway, just as an update. Last night's ceremony for my son's sacrament was beautiful. The parish priest emphasized compassion and that there is no shaming in this sacrament. I was so happy that everything he said almost exactly echoed what I had written here for my son. Great post Joy, and it brought back a lot of memories from my Catholic school days. I did the same thing - looking for my favorite priest so I could go to his confessional! I like the change from Confession to Reconciliation - it has a more positive connotation! How wonderful that you emphasize the love and compassion. Too many of us have gotten the idea that Heavenly Father is this vengeful, hateful being out to destroy everyone who doesn't measure up to His mark. Like you, I see Him as loving and kind. Who infinitely wants to help and guide. Beautiful post!